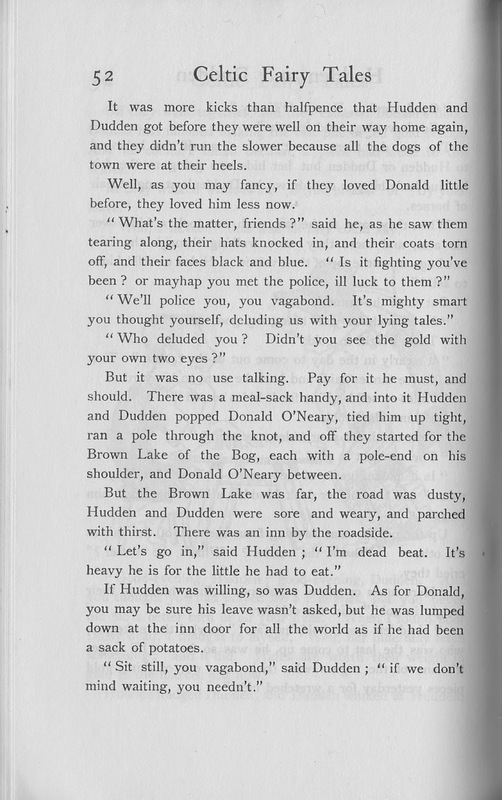 As Saint Patrick's Day nears I looked through various Irish tales I enjoy telling and found one that always leaves me with mixed feelings. 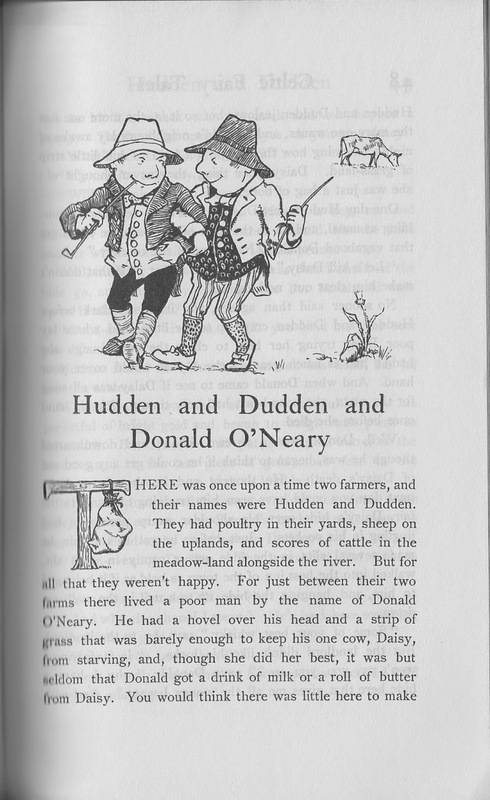 I'm curious about how others feel about the classic tale of "Hudden and Dudden and Donald O'Neary." Recently the international email list, Storytell, discussed tales about Envy. Next month at Paint Creek Folklore Society that's also the topic for what is usually called the Song Swap although spoken arts or other folkloric elements on the month's theme is also possible. I once took a magazine quiz that asked the question "Who do you envy?" and at the time I was ready to answer "Nobody", but later reconsidered . . . musicians. I play and sing to a variety of instruments, but when I make a mistake I can always say, "Now you know why I'm a storyteller!" I love and greatly enjoy music, but not enough to make it my passion the way storytelling is. As a result I planned to tell one of many stories about Envy instead. 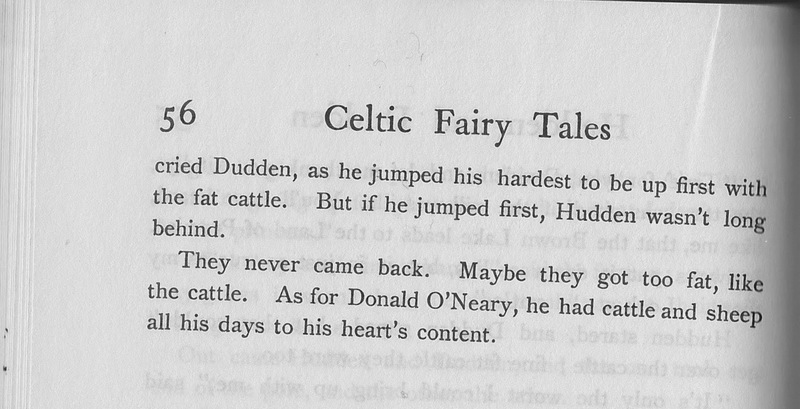 What does this have to do with "Hudden and Dudden and Donald O'Neary?" It's a story about envy and trickery and I would love to get the reactions of others to it. Psychologically, the role of the trickster seems to be that of projecting the insufficiencies of man in his universe onto a smaller creature who, in besting his larger adversaries, permits the satisfactions of an obvious identification to those who recount or listen to these tales. The remaining part of a lengthy discussion mentions the trickster's role in sacred mythology and how the trickster is often a cultural hero, focusing on specific cultures of Africa, North and South America. 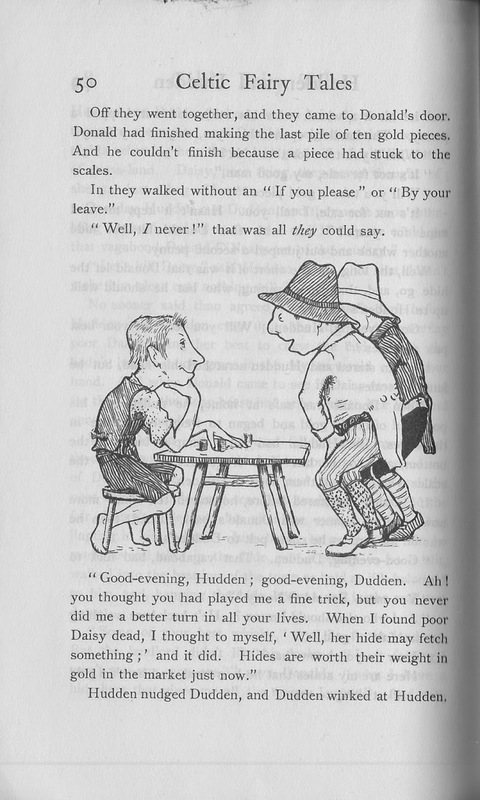 Here's the story, with illustrations by John D. Batten, letting further comment wait until the end. So what do you think about Donald? My enjoyment would be there except for that farmer Donald tricked into taking his place in the bag. 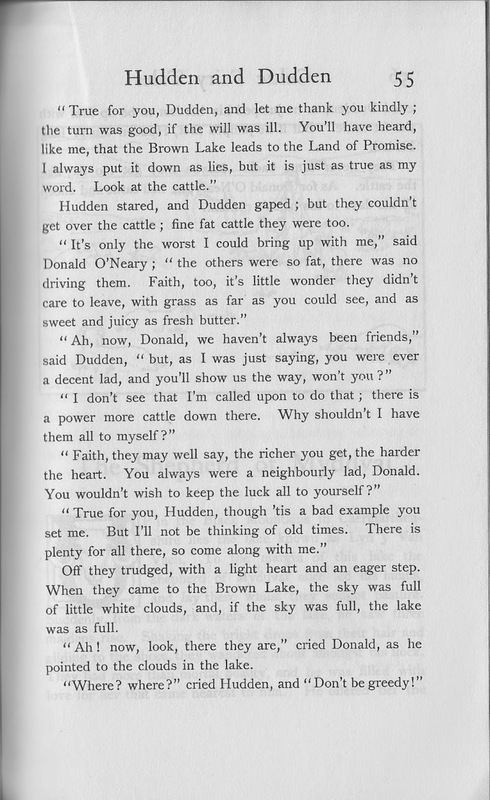 Some would say the farmer was done in by his own greed, the same as Hudden and Dudden, but does that and also Donald staying alive only by his own wits make it right? 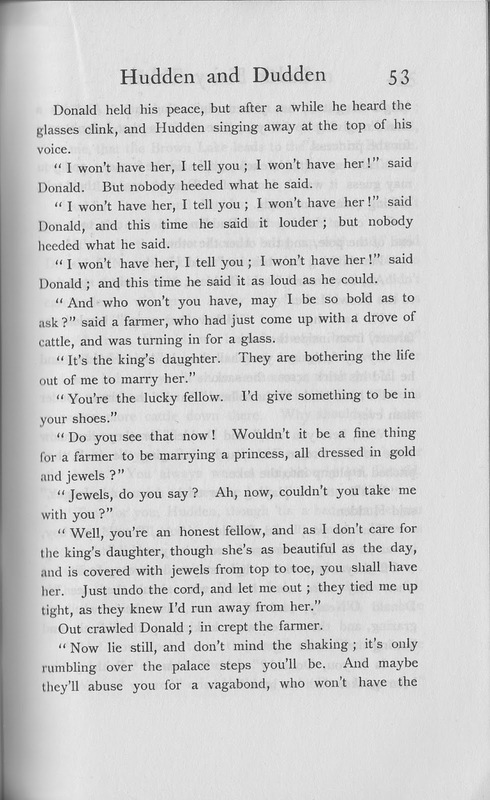 The story is considered a classic and many enjoy telling it, but that farmer spoils the story for me. Is there a cultural explanation I'm missing? 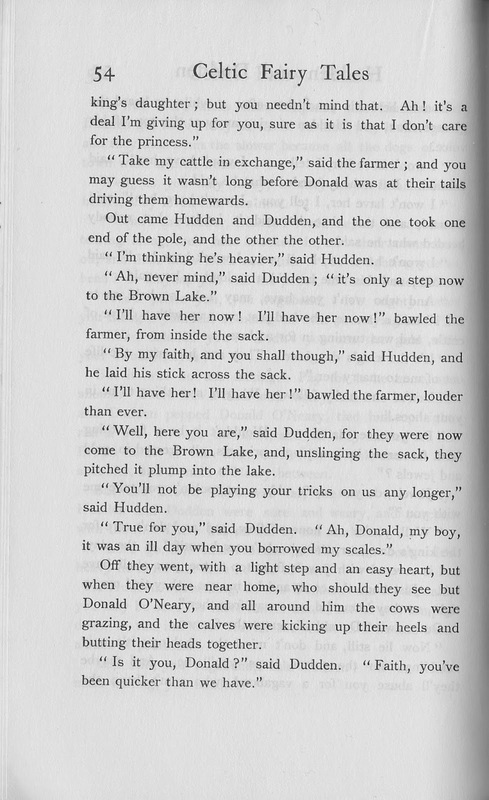 I'd hesitate to tell this in schools for fear that the teacher would ruin it afterwards with a lecture about Donal tricking the inoffensive though greedy innkeeper and farmer. 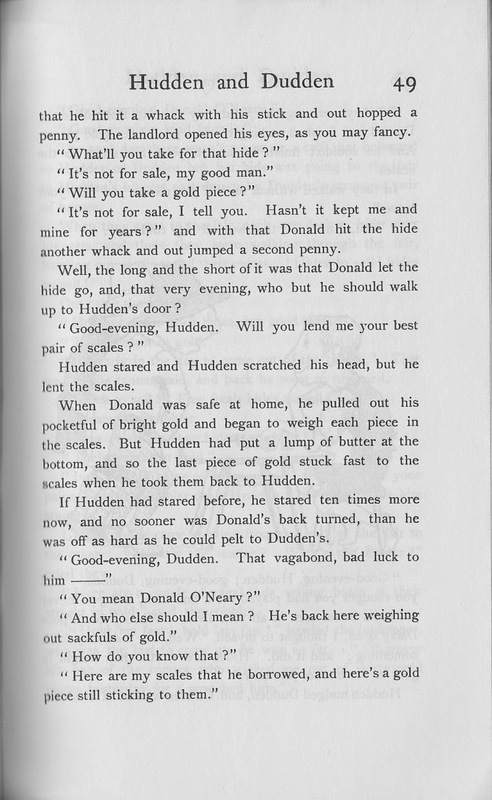 The innkeeper paid for the hide, and the farmer gave his herd in exchange for the sack, so Donal was a thief and a murderer. 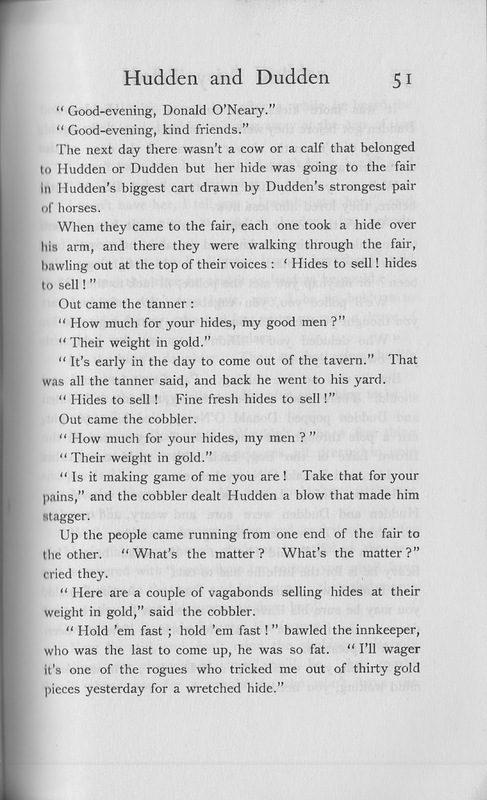 Killing Hudden and Dudden could be justified as self-defense: they'd find a way to kill him eventually if he just escaped from the sack. 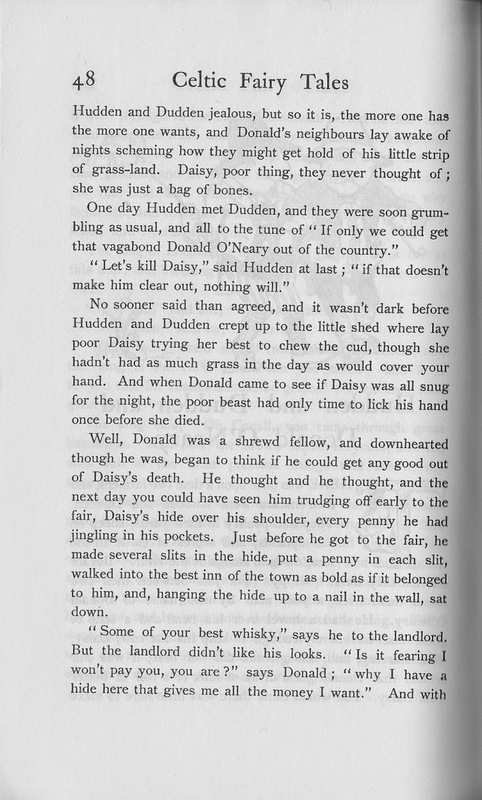 I'd introduce the other farmer' as another character earlier in the story, possibly as a constable who refuses to help Donald when he finds Daisy was killed by the two Englishmen, who then reels out of the pub drunk off duty. I'd also let him escape after being dumped in the lake.